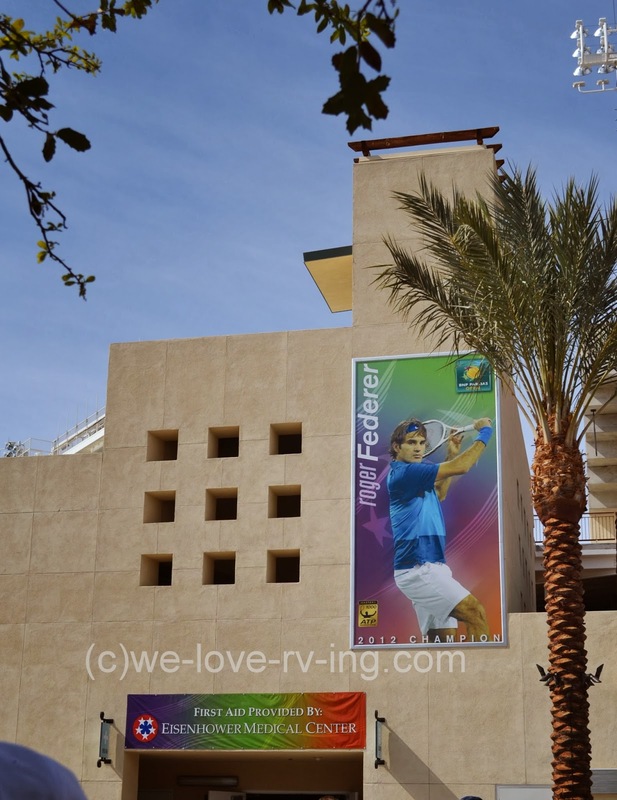 World class tennis comes to the Indian Wells Tennis Gardens once a year but 2014 has much more to offer to this year’s event. 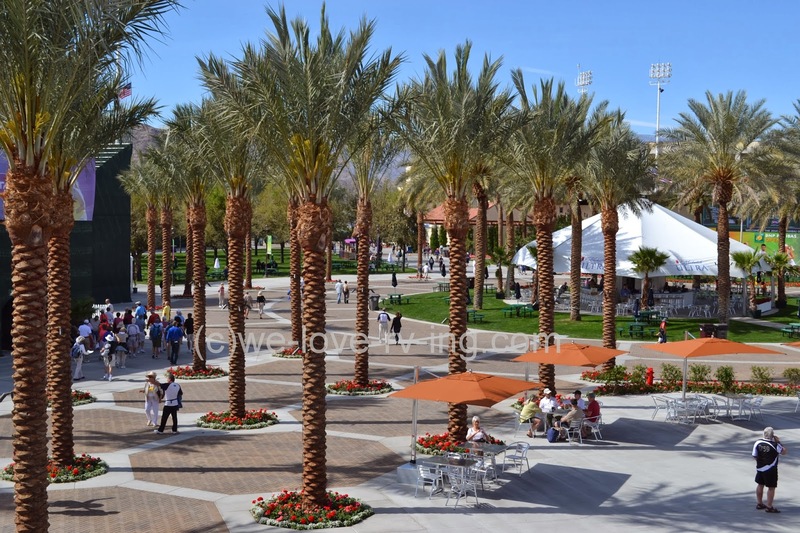 The expansion has been completed and our visit to the facility during the BNP Paribas Open, the most attended ATP (Assoc. of Tennis Professionals) World Tour and WTA (Women’s Tennis Assoc) tennis tournament in the world, gave us a chance to see all that is now offered at this beautiful location. We’ve driven by the Indian Wells Tennis Gardens several times since it was first built in 2000 but have not had occasion to see an event. This year the opportunity was there and we took it and were very impressed with what we saw, even though we aren’t necessarily tennis fans. The grounds offer lots of date palm tree-lined walks with patios and green space to allow for large crowds that would be expected at such events. We arrived early in the day so the crowds were small but it wasn’t long before that changed and this was only during the day of the women’s qualifying rounds. The big draw of the new facility is Stadium 2, an addition to Main Stadium 1 that seats over 16,000. The brand new tennis court offers seating for 8000 to accommodate the large crowds that attend the world class tennis matches. We were here to see early rounds that would not include the top players but those who were rated lower and competing to qualify. Here we were watching a warm-up. The match we did watch was between American Irina Falconi and Camila Giorgi from Italy who turned professional in 2006 and has been touring the circuits. She qualified for the main draw of the BNP Paribas in March and we saw her win this match with very little difficulty. 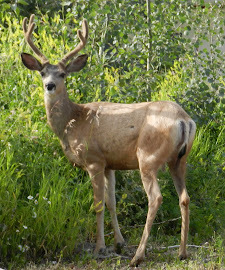 There are several choices for fast food to have lunch or dinner and refreshments along this corridor of the Indian Wells Tennis Gardens. This covered seating area is available for all to bring their lunch to and enjoy their favorite drink. There is a stage that has events scheduled throughout the tournament that is sure to entertain those taking a break from the tennis matches. There are three very nice restaurants, as well. There are several large video walls on the grounds for viewing of the games being played even if you’re not in the stadium. Several games may be ongoing on many different courts at the same time. There are 13 sunken courts as well as the two large stadiums. This year’s event includes players such as Roger Federer, winner in 2012, Rafal Nadal of Spain who is defending his 2013 title and considers it one of the best tournaments in the world. Maria Sharapova from Russia who recently reported on the 2014 Winter Olympics for NBC is defending her 2013 title and will be a highlight at this year’s event. There were practice games being played on some of the ten practice courts within the 54 acres of Indian Wells Tennis Gardens. The women were playing on the day of our visit but the practice courts had men getting ready for their turn on following days. We also watched part of the match played by Anastasia Rodionova and Alison Van Uytvanck who would serve that ball at 100 mph. The event hosts over 300 of the top rated tennis players in the world so any game watched is of the highest caliber. 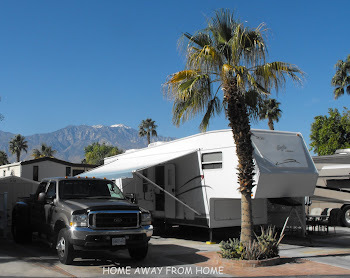 There is room for 7000 vehicles at this location with an incredible backdrop of the San Jacinto Mountains. Although we only spent a few hours for our visit, there sure were a lot more cars there when we left. Space for 2000 more cars was made during the recent renovation and I expect they were all filled as the two week event progress in the final days. 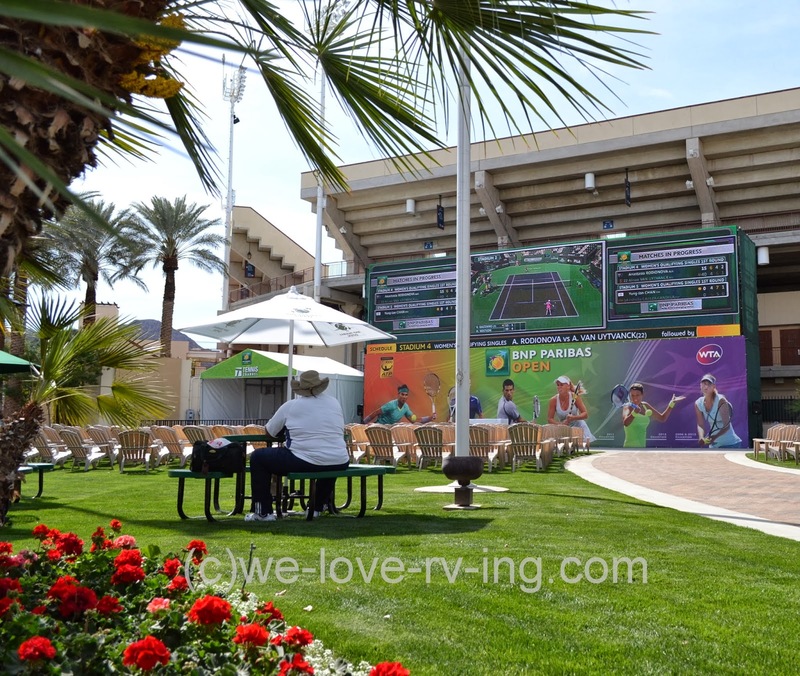 The Indian Wells Tennis Garden is used for several tournaments and concerts throughout the year but the world class BNP Paribas in March is a major one. Tennis fans from around the world come to view the event and will enjoy being a visitor to this venue; we sure were.